Bailey was skinny, matted and covered with fleas when he was rescued from beside a road in rural Tennessee by someone from Grainger County Humane Society. 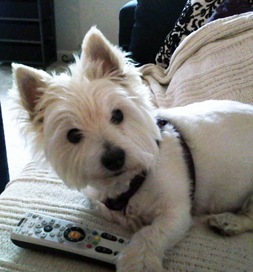 The West Highland Terrier was cleaned up, placed in a foster home and listed on Petfinder. Amanda Howell of Chattanooga saw his listing and went to a meet-and-greet to see if he was a good fit for her. “A trip to Walmart and $150 later, I had a crate, food, bowls, blankets and a dog,” she says. “What show shall we watch?” Bailey seems to ask. At doggy day care, he takes all the toys in the room and puts them on a chair and then sits on them. He loves to chase squirrels up the tree then bark and leap at them when they come partly down the trunk as if to tease him. “He has been a bright spot in my life, and I can’t imagine my day without him,” she says. “I didn’t rescue this little guy; he rescued me. “He’s an old man now. He has arthritis, cataracts and doggie dementia and is on daily meds. He has a hard time walking up the stairs, but is still playful and still sleeps with me every night (unless it’s a night he doesn’t recognize me and hides under the bed).” Sometimes when he awakens from a nap, he can’t see her and becomes alarmed, running to every room in a frantic search.